Version 1.30 is the latest version. Delete or rename the 2dboyLogo folder. If config.txt doesn't exist in the above location, you can copy it from <path-to-game>/properties/. External video settings (GOG.com version). 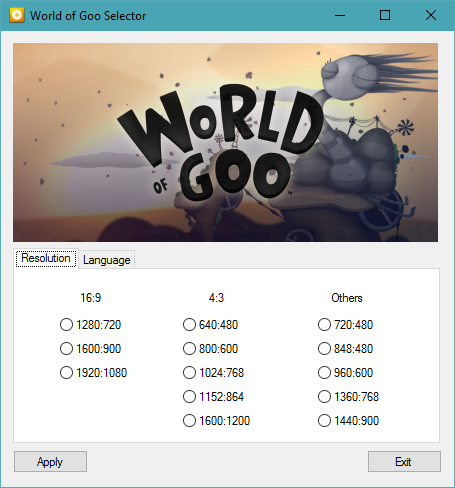 Only some resolutions listed (GOG.com version). See Widescreen resolution. The game attempts to detect the correct resolution on start-up. Sometimes it may be necessary to set it by hand. Select your desired resolution and click Apply. Must be edited in config. Set windowed or borderless fullscreen windowed mode. Find the line saying <param name="language" value="auto" />, and change auto to the appropriate language. 4 Linux only. Enable in the config (manymouse). Requires multiple mice. When running the game (on Steam) while using more than one monitor the screen of the game spans across both monitors. Search for the line < !-- Graphics display -->. Insert the width and height of your primary monitor at <param name="screen_width" value="1920" /> and <param name="screen_height" value="1080" />. When running the game (on Steam) while using more than one monitor the screen of the game flashes multiple times before crashing or closing the game using the task manager. Since the in-game options doesn't give a possibility to run the game windowed the only way to run it so is to force it through the 'Properties' menu. For exmaple disabling desktop themes and desktop compositsion. Happens for some people on start up, usually when the game has finished loading or when the 2D Boy logo appears. In most cases, this is due to an incompatibility with some newer Nvidia drivers. Fortunately, there are two known ways this can be fixed. 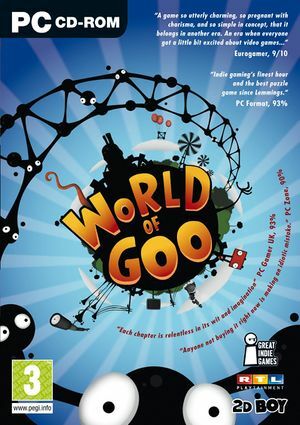 If you've bought World of Goo outside of Steam, try installing it through the official site or Humble Bundle (or wherever you bought it from) without using Steam. This will however mean you will not be able to use Steam achievements or some other Steam functions. 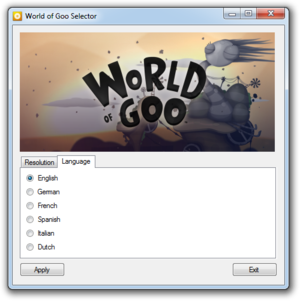 If the first solution did not work, or you want to continue using World of Goo through Steam, try installing an older Nvidia driver here, or here to roll back to a previous driver. The Steam Version can cause issues on 64bit PCs. To fix this problem the newest WoG patch has to be installed which is not that easy. It's recommended to apply the patch to a completely different folder and then copying over the newly created files into the Steam installation folder. The patcher is available here. 1.4 OS X and Linux only.